Video content is huge these days, especially with live streaming and various social media platforms like YouTube, Facebook, Periscope, Snapchat and Instagram that make creating and sharing videos easy. Bradley Szymanski tapped into the benefits videos have to offer when it comes to teaching, inspiring and educating people. He noticed this and has been using videos to impact and change the lives of his audience. "It has been about 7-8 months since I first started making videos. What inspired me to start recording videos and put them on YouTube, Snapchat, Instagram, etc. was the realization that I could help others at scale." Discovering the right medium to touch his audience, Bradley backed up his efforts with his talent, gift and passion to help others. "...I have basically been kind of a 'life coach' for sometime now. Not a certified practising life coach but I have always been that person that would help people through tough times and anyone could come talk to me and open up with me and I would be there to listen and help as best [as] I can. I have always enjoyed that." 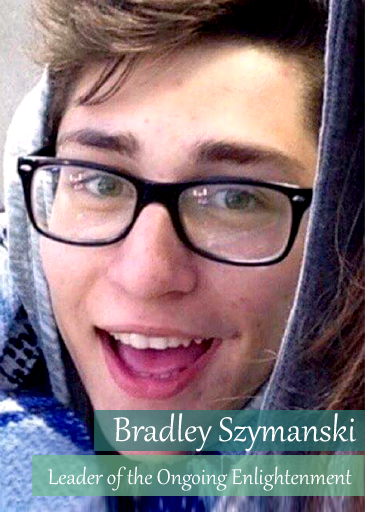 Although Bradley is just 19 years old, he has been changing lives in a fundamental way. He has helped people see that they have what it takes to be the best version of themselves. He shared an instance where he helped a girl who was having a tough time and advised her on what exactly she had to do to get better. Impacting people gives Bradley joy, fulfillment and a sense of purpose. "I remember distinctly the moment I knew what I wanted to do for the rest of my life. I was chatting with a girl that I didn't know too well. We were just talking casually and she told me she was crying (we were talking via text). I asked her why. We dove deep into the issue and I shared with her what had helped me in that situation and what I think she should try to do. That girl messaged me a few weeks later again saying that she was crying but crying tears of joy because what I had advised her to do truly changed her life for the best. I had actually helped her in a serious way and she couldn't stop thanking me. Now, I'm not trying to put myself on a pedestal by telling you I did this but the feeling - that feeling of knowing that I had truly impacted this girl and very possibly changed the course of her life in a positive way - that feeling is like nothing else. It is pure ecstasy and is why I do what I do." Bradley's videos have been receiving positive feedback, but just like every successful person, he experiences negative ones too. Despite this, he is moving strong and doesn't allow them to stifle his vibe. Having haters is only a sign that you're on the path to success. "Of course, I have had my fair share of haters and trolls. And of course most people laugh at me when they see what I am doing but that doesn't really bother me because I know that there are people that I am helping and impacting. Something one of my mentors taught me is that if you [don't] have any haters then you aren't doing something big enough. Every great person in history has had an enormous amount of haters. It's just the price you pay for thinking different and having ambition." When asked what inspired him the most Bradley said, "The freedom to pick and choose to do whatever I want - that and the endless opportunity that the internet now provides and the fact that I am living through one of the greatest times to ever be alive in human history." Thanks to the internet and the immense innovations that enhance and complement it, millennials can do much more than just have access to information. Millennials can use this medium to change the world, improve people's lives and give themselves a sense of fulfillment. "Fulfillment is all about contribution. So what are you doing to bring [fulfillment] to the world and the people you come in contact with? A fulfilled life is a life full of passion, purpose and positive impact." Bradley makes it clear that fulfillment is not something you do or a goal you have to reach. It is more about the quality of the life you live that gives you the spark to get you going. "Fulfillment can often be mistaken for 'oh, when I get this thing or reach that goal, I'll be fulfilled.' But that's terribly wrong. You can't necessarily obtain it because it is like the battery on your phone except you aren't fully charged with fulfillment when you start your day but you pursue life right and with purpose." The first way is to be "fully conscious and aware of what serves you and what doesn't," then cut out what doesn't serve you and focus more on what does. "You can 10 times the quality of your life in just a few weeks by simply being aware of what isn't giving you a great quality of life." The second way is to be grateful. "Understand and realize how good life is and how lucky you are to have what you have." The New Year is just around the corner and Bradley has a lot planned to make 2017 great. "2017 is going to be a huge year for me and my business because it is when everything will really be taking off. I will be taking coaching clients, traveling all over volunteering, speaking and spreading my message not just through social media but actually giving speeches at high schools and many other places, begin to write my first book and possibly towards the end of the year I may be launching 'The Ongoing Enlightenment' clothing brand but that is all dependent on how big my following is towards the end of the year." Age is just a number and should not be used as an index to measure maturity or wisdom. Although Bradley seems quite young to be a life coach, he does not allow his age to stop him from helping others. "[Being a life coach] has always been the goal...the feeling of knowing that I helped someone to live their best life is just the absolute best feeling in the world." Bradley is not disturbed about the competition but wholeheartedly embraces his unique qualities. This is what will make him stand out. And in the end, it is one's differences that make up your unique selling point. "As a life coach  or at least in my field of life coaching  you don't necessarily have to try to stand out or be different. We are all unique and different in our own ways. We all see the world through our own lens. People who resonate with my video more than the other guy's will want to have me as a coach. [It's] just the way it is. Now, of course, I am determined to add as much value as possible to my clients but that is no different from any life coach I am sure or else they shouldn't be in the profession." Bradley is giving out free coaching in 2017. If you'd like to be among Bradley's clients, then click here to sign up.